Thus spake the journalist with the sweetest gig ever as we sat sipping Tilquin Lambic Blend at Chez Moeder Lambic a couple months ago. And just a few weeks later, his advice was heeded, and the prophecy was fulfilled at The Standing Order on George Street. It is a pretty amazing pub. Being a Wetherspoon place might put some people off, I know -- another big chain bar dominating the market and squeezing out the little guys etc. But this location is special: a converted bank, it is really quite a grand space for enjoying a pint. Wetherspoon’s Counting House in Glasgow, also a former bank, is similarly impressive. Apparently the most popular cask ale in Scotland, Deuchars IPA from Caledonian Brewing is an odd sort of beast. Hop heads looking for modern mouth explosions of passion fruit, grapefruit and pine will be disappointed, as will fans of bubbles. Honestly, when it comes to beer, you wouldn’t know she was brought up in the UK. I also suspect the salt and vinegar crisps were throwing off her senses, because Deuchars IPA is nothing to complain about. The hoppiness is there, I think, but it’s a very hempy sort of hop flavour, not the sledgehammer tropical kind you find in, say, a BrewDog or an American IPA. Interestingly, Deuchars IPA is only 3.8% ABV, which makes it light, refreshing and sessionable. I might not rave about it like my journalist friend, but I find nothing to fault it either. In fact, with the greatest of respect to my better half, I quite like it. Though yes, it’s flat, so if you need bubbles in your brew, this -- and countless other British ales -- won’t be your thing. My wife lived in Edinurgh for several years before I dragged her south of the border all the way to Devon. The Standing Order is one of my favourite pubs in Edinburgh, the Beehive on the Grassmarket being another. 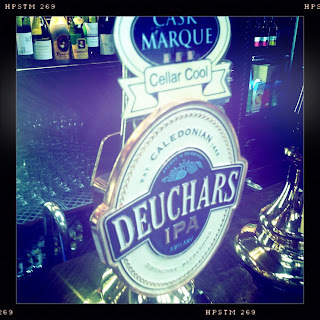 Deuchars is not my favourite Caledonian brew, I much prefer the 80/-, but I'm a bit old school like that. Just like you, I was given quite a hype about Deuchars, and, like you, I quite like it, and at 3.8% a very pleasant session to be had. Nice blog, glad I found it.